A new Simon’s cat Q&A has arrived, featuring Simon Tofield and Liza (Art Director) for, as the YouTube video notes, “a special fan Q&A session via Live Chat – ahead of the PREMIERE of our new SHORT – ‘Borderline’!” You’ll learn a lot about the process of making short videos (very involved), and about Simon’s real cats. Here’s the first of three segments of “Borderline”: more to come in succeeding weeks! Curiously, the piece is in the HuffPo “religion” section, and is by Carol Kuruvilla, the house apologist for all things Muslim. 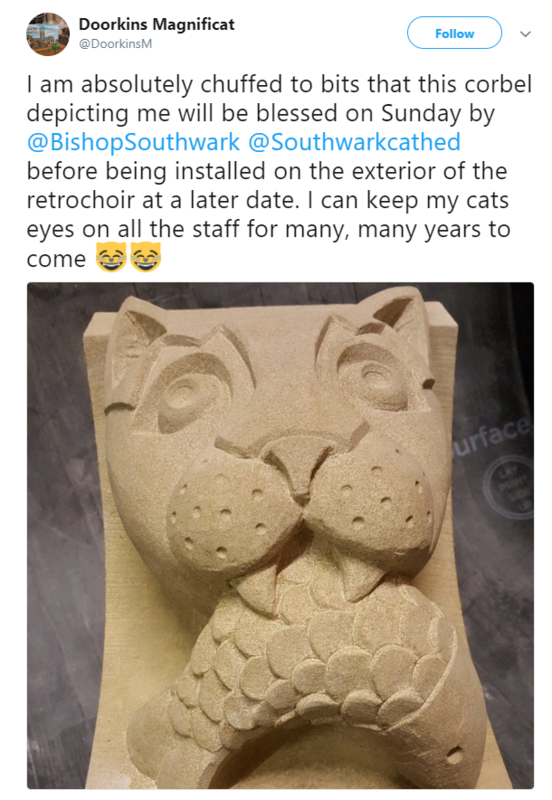 Doorkins Magnificat is featured in a piece at GoLondon from the Evening Standard; she’s about 13. 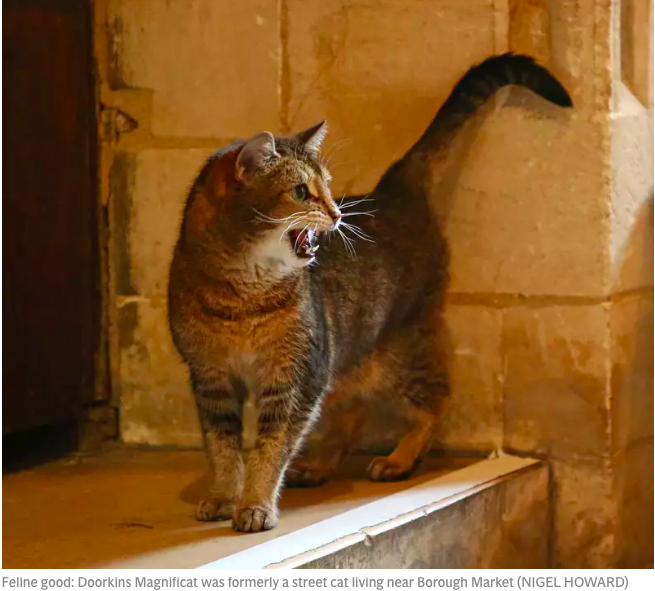 Doorkins is a pun on Richard Dawkins, the evolutionary biologist and atheist, and the fact the cat took a long time to cross the doorway of the cathedral after first being fed by the vergers. The Magnificat, or Song of Mary, is sung by the clergy every day. The corbel was made by the City and Guilds of London Art School, based in Kennington. And finally, a well-lettered cat, Orson of Down in Denver bookstore, although the store is in Stephentown not Denver. (The name is a Kerouac quote). It’s a books-only, no-frills book store, plus a cat named after Orson Wells. And freshly-baked cookies. 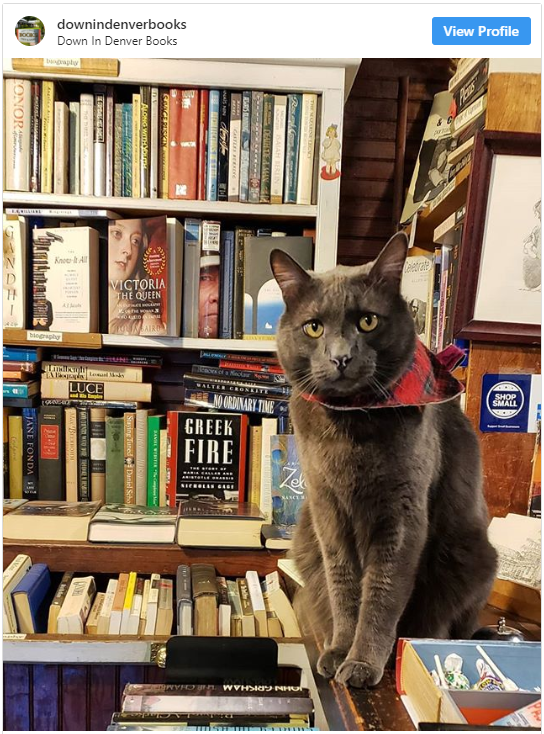 Orson was not available for comment but his staff commented: “There’s used bookstores like us around the corner, you just have to look for us.” It appears to be a respectable living for an honest cat. This entry was written by whyevolutionistrue and posted on August 18, 2018 at 8:00 am and filed under Caturday felids. Bookmark the permalink. Follow any comments here with the RSS feed for this post. Both comments and trackbacks are currently closed. Another entry for Caturday. This is from the instagram account of the University of Chicago library. The best known work by the artist Lorado Taft is the Fountain of Time which is at the west end of the Midway Plaisance which runs through the University of Chicago campus. Taft’s studio was located on the Midway. It is now part of UofC. This picture was taken in Midway Studios. A festive feline joins sculptor Lorado Taft and friends for lunch in Midway Studios. The artist must have not minded, as the cat's dish balances carefully on the plaster model of his "Fountain of the Great Lakes". #BlackCatAppreciationDay @uchicagoscrc #midwaystudios #loradotaft #uchicagoarts #uchicago #uchicagocats #uchicagolibrary University of Chicago Photographic Archive, apf1-08072, Special Collections Research Center, University of Chicago Library. Nice to see that Doorkins’ staff has a sense of humour.